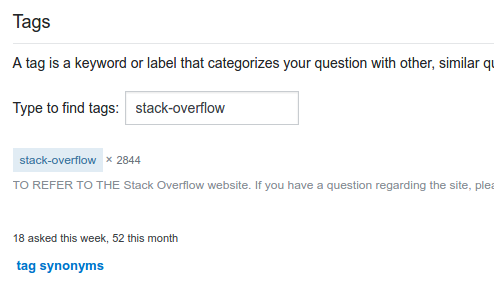 DO NOT USE THIS TAG TO REFER TO THE Stack Overflow website. If you have a question regarding the site, please go to http://meta.stackoverflow.com. A stack overflow occurs when too much memory is used on the call stack. However, when searching for this tag, the "DO NOT USE THIS TAG" part seems to be stripped. Related: Why are some tag excerpts cut on the Tags page? Browse other questions tagged bug tags tag-search tag-excerpt . Accept or Reject tag excerpt simply defining the concept?